THE cafés of South End Green have long had a reputation for grizzled poets spinning out coffees while they chew pencils, nurse hangovers and stare at blank notebooks. Now, in honour of the area’s literary traditions, poets will have the chance to leave the confines of the corner table and take their art to the surrounding streets. 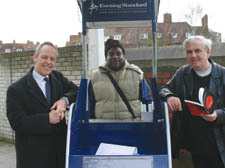 Known as the Poetry Box, the idea is similar to Speakers Corner: an old newspaper sellers stand outside the Hampstead Heath train station has been commandeered and will be occupied every Saturday lunchtime for shoppers and browsers to be entertained by the areas leading poets. Starting at the weekend, the first to offer literary insights to the world around was acclaimed poet Paul Birtill, and he’ll be stepping up again this Saturday. He said: “It went well – I sold a few books too. Lots of people stopped to listen. “It is different from performing at poetry clubs. Organiser Jonathan Bergman, the secretary of the South End Green Traders Association, said: “Our cafés are full of poets and the Poetry Box is designed to give them a place to perform.